The Levo GigLight Bright LED Book Light holds a bright light over your paper or book, making it easier for night readers to see. The advanced lighting technology incorporated in laptop computers is the same amazing 10,000 hour life fluorescent lamp of the Levo GigLight Bright LED Book Light. Most book lights only have a 40 to 50 hour life. The Levo GigLight provides an even, cool wash of clean white light for reading or writing at your desk or in bed. 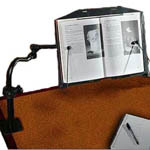 The pivoting arm eliminates the "bouncing light" effect found in other book lights. Clip the GigLight to your Levo Book Holder or sit it on your nightstand or desk. 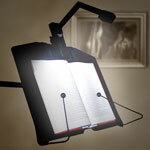 Which ever way you choose to use it, the Levo GigLight is a great way to read and study, enjoying your peaceful night. Runs on 4 AA batteries (included) and measures 5 inches when folded. Sold with or without AC Adaptor. The Levo™ BookHolder Desk Model offers five unique movements to perfectly place your book for reading. 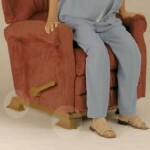 Getting out of your favorite Recliner is made a lot easier with StandEasy Chair Lift!